This is my favorite way to prepare asparagus. It makes the perfect side dish for almost any meal. Plus asparagus is amazing for your health! Did you know it has more folic acid than any other vegetable, is good for urinary health, and prevents depression? AMAZING! 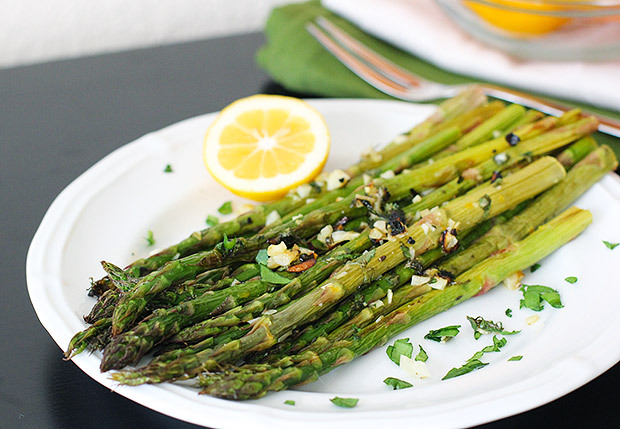 In a large glass baking dish, toss the asparagus with the olive oil and garlic. Season lightly with salt and pepper, and toss. Bake until the asparagus are tender and lightly browned, 15 to 20 minutes, depending upon the thickness of the stalks. Stir twice during the cooking process. Remove from the oven and toss with the lemon juice. Add more salt and pepper, if needed. Enjoy! This sounds really delicious and healthy. I can’t wait to give it a try! Thanks! I hope you enjoy it as much as we do!